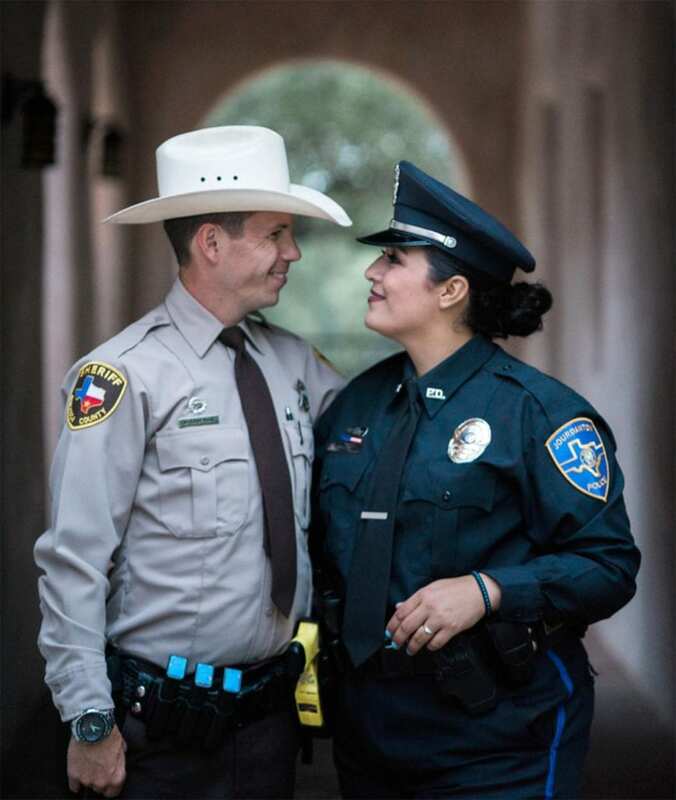 Jourdanton Police Investigator Mari Magana and Atascosa County Sheriff’s Deputy Daniel Kaufman were blessed to be the winners in the fifth annual Badges & Bouquets Dream Wedding Give-Away Contest. Mari has served with the Jourdanton Police Department for a year and a half and served with the Pleasanton Police Department for 2 1/2 years prior to that. January will mark five years that she has been in law enforcement. The couple have been together for six years. Mari met Daniel when she lived in El Paso. 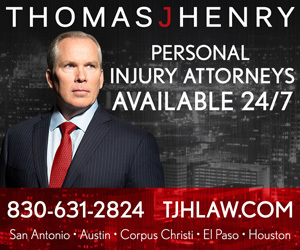 He worked as a deputy in McMullen County before being hired with Atascosa County. 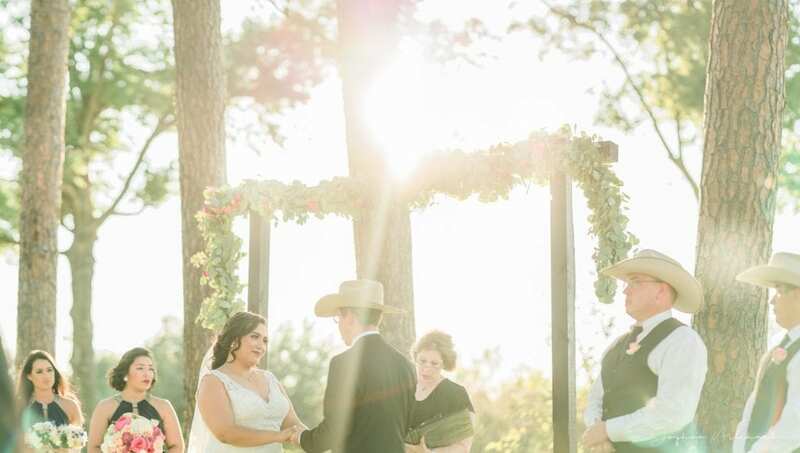 They wed Friday, Sept. 1 at Strawberry Pines in Poteet. The contest is the brainchild of Tina Humphrey, wedding planner and owner of Diamonds & Dreams Event Consultants. The contest is open to San Antonio area first responders (police officers, fire fighters and emergency medical technicians) and their fiances. The winners receive a complete wedding package valued at approximately $50,000. The contest is Humphrey’s way of giving back to those who sacrifice so much. 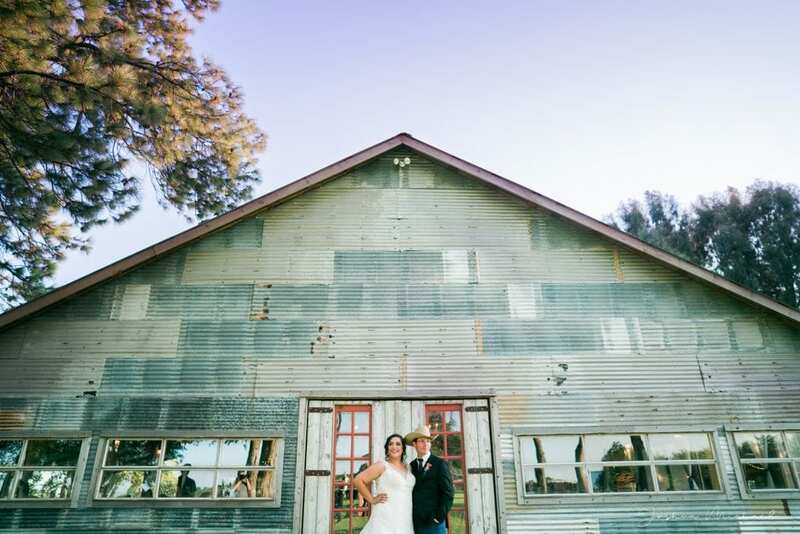 Mari’s contest entry stood out because she and her husband are both in law enforcement. Daniel also served in the military. There are almost 40 vendors this year. Along with Woode and Darlene Henry of Strawberry Pines, other area sponsors this year are Susie Martinez of Creations Cake Shop in Pleasanton, Tammy Blalock of Ata-Girl Photography and Melissa Rodriguez of Party Rentals of Devine. Strawberry Pines, said Humphrey, has been the most flexible venue she has ever worked with. Darlene Henry had some very personal reasons that drove her desire to give back to the first responder community in this way. Right out of high school and newly married, she worked with the New Mexico State Police, part of a close-knit law enforcement family. “Unfortunately, I knew the pain of losing one of ‘my guys’ in the line of duty,” said Henry. She experienced that deep sense of loss 16 years later when her cousin, Atascosa County Sheriff’s Deputy Thomas Monse was killed in the line of duty. “The sacrifices first responders make to ensure the safety and surety of the community are beyond what words can describe. For me to give back in this way, as part of such a joy-filled and gratitude-filled event was an honor. It was an honor to celebrate the lives of this beautiful couple and all they do. It was a way to give back in memory of my cousin and the other officers I knew first hand that had given their all,” said Darlene. Mari found out about the contest from Jourdanton Police Chief Eric Kaiser, who knew Mari and Daniel were getting married. He gave her a card from Strawberry Pines with a link of Badges & Bouquets. Kaiser let her know about the contest and suggested she look into it. She researched it a little more, discussed it with Daniel and decided to give it a try. Those entering the contest had to write a 500 word essay explaining who they were and why they deserved to win the contest. A phone interview with Tina followed. The three finalists had the opportunity to tour the venue separately, which is when they met the Strawberry Pines owners. Another interview followed with Tina and Darlene and then the winner was chosen. The winning couple was announced on Feb. 14, via Facebook. The wedding package was more than they ever imagined. They are both extremely grateful for being chosen. Growing up, she initially wanted to be a teacher for special education children. She began working in special ed since she was in fifth grade, because that was the youngest that you could start helping out. She would volunteer at summer school. During her senior year at Fillmore High School in California, she worked with severely disabled students. She began seeing life in a whole different light. However, while attending Fresno State University, something switched for her. She wanted to work for children, rather than with children. She chose law enforcement. “My main focus is the crimes against children. That was my biggest thing. I wanted to help the kids because I saw a lot with my friends. I was very fortunate that I had a good family, a good upbringing and a great set of parents, but I know some of my friends didn’t get that. Now as I am older and doing this job and working these cases, I realize, oh, my gosh. Some of my friends were in these bad situations, and I didn’t realize it then. So being able to recognize that with other kids and being able to help with that is rewarding. Mari appreciates having Daniel to lean on and vice versa. She described it as a double-edged sword sometimes, because being in the same line of work can make it difficult to unplug. However, they appreciate having a spouse who understands. “Everyone has been really great. We can’t put into words how thankful we are with everybody. Everybody’s generosity has been overwhelming. When we thought about getting married, we thought we’d have something really small. So to be able to do this, it’s really great. They really do go above and beyond- all of them. And Tina is amazing. She has pretty much done everything for me,” said Mari. Vendors this year are: A Touch of Elegance- linens for all tables and napkins, Aly Am Paperie- invitations/response cards, Anne Marie’s Catering- full service wedding day meal, Ata-Girl Photography- rehearsal dinner coverage, Bartenders4you- beer/margaritas/champagne, Bella Bride- discount on bride’s gown, Blooms (H-E-B)- ceremony and personal flowers, Blume Haus Florals- reception flowers, Cakes By Cathy- groom’s cake, Cottonwood Prints- calligraphy and fallen solder letters, Creations Cakes- bride’s cake, Diamonds & Dreams Event Consultants-event coordination, Dos Kiwis Photography- boudoir and bridal portraits, Event Ignition- lighting for exterior and interior, Joshua Michael Photography- engagement session and wedding day coverage, Live Event Painting- painting for client, Luxe Decor- chargers, Mark Thomas Video- video, Marquee Rents- dining room chairs, Moon Struck Weddings- ceremony officiant, Party Rentals Etc.- all dining tables and chairs for ceremony, Photo Buzz Studios- photo booth, Rustic Romance Rentals- two lounge set-ups and peripheral decor, San Antonio’s Best DJs- DJ for cocktail hour and reception, Smoke in the Hills BBQ- rehearsal dinner and dessert, Stella Haus Films- engagement film, Strawberry Pines- venue and lodging, Stringmusic.Net– ceremony violinist, Superior Celebrations- lanterns for decor, Vanity Eiland- hair and make-up, Vision Lounge- chandeliers, Sharee Irwin- vocalist, Sybilla Irwin- unity wine box creation, Meda Nix- Lipsense lipstick, Lost Mission Wedding Venue- engagement session location and The Westin Riverwalk Hotel- bridal portrait session location.